Updated Wednesday June 29, 2016 by Soccer. I, the parent/guardian of the above named registrant, agree that the registrant and I will abide by the rules of the Eastern Pennsylvania Youth Soccer Association (EPYSA) and the Central Bucks Athletic Association (CBAA), their affiliated organizations and sponsors. I will honor the Positive Coaching Alliance Parent's Pledge. Recognizing the possibility of physical injury associated with soccer and in consideration for CBAA accepting the Registrant for its soccer programs and activities (the "Program"), I hereby release, discharge and/or otherwise indemnify CBAA, its affiliated organizations and sponsors, its employees and associated personnel, including the owners of the fields and facilities utilized under the Program, against any claim by or on behalf of the Registrant as a result of the Registrant's participation in the Program, and/or being transported to or from the same, which transportation I hereby authorize. I grant CBAA the unlimited right to utilize and / or reproduce photographs and likenesses of my child(ren) for the internal or external promotion / informational activities of Central Bucks Athletic Association across all media platforms. I may request that my child’s likeness not be used, by notifying the soccer office in writing. Where applicable, I also understand that the Registration Fee becomes non-refundable once the rosters are formed. 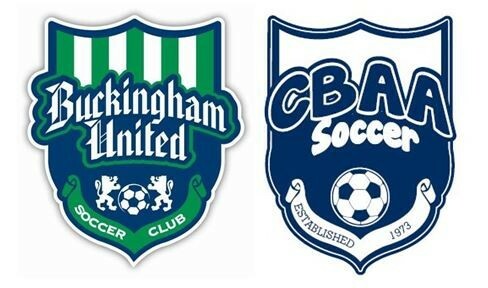 CBAA Soccer and Buckingham United Soccer Club strives to foster a fun atmosphere where player development and enjoyment takes precedent over winning. Good sportsmanship is required by all parents, spectators, coaches and players and failure to demonstrate that could result in suspension from one or more games for coaches, parents and players. · Parents and other spectators should not give instructions to any players during the game; this is the coach's responsibility and it can confuse players when they receive instructions outside of their coaches during the game. · Parents, coaches, players and other spectators should refrain from any derogatory or offensive comments or actions to other players, coaches, referees, parents or other spectators. Only positive, encouraging comments should be used. · Players, parents, spectators, and coaches may not argue or challenge referees. Coaches may ask for clarification, parents should refrain from speaking to or yelling out to referees. If parents have any issues with coaches (playing time, game strategy, etc.) the situation should not be addressed during a game. I, the parent/guardian of the above named registrant, agree that the registrant and I will abide by the rules of the Eastern Pennsylvania Youth Soccer Association (EPYSA) and the Buckingham United Soccer Club (BUSC), its parent organization, the Central Bucks Athletic Association, affiliated organizations and sponsors. Recognizing the possibility of physical injury associated with soccer and in consideration for BUSC accepting the registrant for its soccer programs and activities (the "Program"), I hereby release, discharge and/or otherwise indemnify BUSC, its affiliated organizations and sponsors, Its employees and associated personnel, including the owners of the fields and facilities utilized under the Program, against any claim by or on behalf of the registrant as a result of the registrant's participation in the Program, and/or being transported to or from the same, which transportation I hereby authorize. I further certify that I have read and agree to the Buckingham United Soccer Club Pledges. The CBAA Soccer program is dedicated to the task of promoting and enhancing the culture of soccer for the youth and families of the Central Bucks area. The CBAA Soccer program will strive to develop players at all ages and levels of play: recreational; travel; and premier. We are dedicated to developing players and coaches to the highest level through a quality instructional program. In addition, the mission of the Buckingham United Soccer Club is to promote, foster, and perpetuate the game of soccer and to provide an organization for travel soccer teams to play at a competitive level. The coaches of each Travel Team should seek to develop and promote the physical, mental and emotional growth of each player. To this end, the coaches shall ensure that each player in good standing is given equal opportunity to participate in practices and training sessions. Further, for Travel Teams in the U11 and under age brackets, the coaches shall make their best efforts to allow each player in good standing to have meaningful play in league and tournament games.